Capcom and Numskull Designs are incredibly proud to announce the officialResident Evil 2™ merchandise range, to coincide with the upcoming launch of Resident Evil 2 for the PlayStation 4, Xbox One, and Windows PC on January 25th. Resident Evil 2 fans can feel like they’re part of the action with the official scented candle and R.P.D. 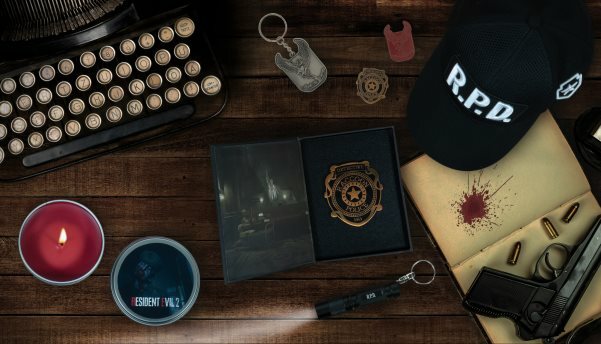 pin badge, can look the part with snapbacks and t-shirts, and can join in on the action with a flashlight keychain inspired by the flashlight used by Leon and Claire throughout the game. Following the success of Numskull’s official Resident Evil 7 scented candle, this is truly a one of a kind collectible for fans of the world’s best survival-horror franchise. With the curious, distinctive scent of the undead, this is an incredibly unique collectible that deserves its place in every fan’s home. Only the bravest of Raccoon City residents light it up while playing Resident Evil 2 for that immersive smell of a deadly zombie horde! Become a member of the force with this official collector’s R.P.D. pin badge, inspired by the Raccoon City Police Department officer’s badge! Displayed in a Raccoon City Police presentation box, this large pin badge is designed for long-time fans and newcomers alike. Whether you keep it in its display box or wear it with pride, your authority as a Resident Evil expert cannot be denied. The range is now available to preorder here, and will launch to coincide with Resident Evil 2 on January 25. The full range is available to pre-order now at Geekstore.com, with select products available at retailers around the world including Amazon, GAME, GameStop, Target, Best Buy, EB Games and many more from January 25th.